Lera Auerbach has had an obvious love of Shostakovich’s piano music for a very long time for her first brush with transcribing any of the 24 preludes for piano was in 2000 when she completed Dmitri Tsyganov’s transcription of 19 of them by adding the “missing” six. She then followed this up in 2008 by transcribing all of them for cello and piano and finally by making the version for viola and piano we have on this disc in 2010 after receiving a commission from the Philip and Muriel Berman Foundation for the Great Lakes Chamber Music Festival. She comments that she had in mind that the version for viola and piano could be seen as a companion piece to Shostakovich’s markedly contrasting work, his Sonata for Viola and Piano, op.147 of 1975, his very last completed work. She added that since the preludes were an early work people would be able to enjoy both sides of the composer. By that I presume she meant enjoy both sides of him through the medium of the viola and that by both sides she was inferring his public face and his private one, both of which were revealed together in many of his works at times providing you understood the key. He was someone who was able to embody subtext within his music which he put to good use when wishing to speak to ordinary people about things that were impossible to voice in words. One of the most remarkable aspects of Shostakovich is that his genius was evident throughout his career with very few questionable pieces that could not be described as works of genius. Auerbach also points out that there is a lot of humour in the preludes and I agree; there is a great deal of humour in much of what he wrote even though it is so often wry and sardonic rather than knockabout. There was a time when I balked at transcriptions feeling that it would be unlikely that a composer would not have done their own version had they wished to because it would be wrong and disparaging to imply that they would never have contemplated it. I can’t imagine that Shostakovich would not have written more for viola had he been moved to and while it may well be a shame he never did should others ‘do it for him’? Now I take a slightly less proscriptive view providing the transcription stands up to scrutiny and I must admit Lera Auerbach’s does so exceedingly well. It gives a completely fresh listening experience which dividing the ideas between two instruments is an inevitable result. The viola gives an altogether richer, darker tone and it was extremely enlightening to read Kim Kashkashian’s take on the viola as instrument saying that it almost possesses a mind of its own and is never completely tameable, but that it can be helped to work along with the violist in producing sounds that seem like a “voice from within”. Listening to the original piano version again I was struck by how ‘alone’ the pianist seemed to be while the present version is of course a collaborative process, a blinding statement of the obvious of course but that’s why the viola and piano version creates a completely different atmosphere to the extent that it sounds and feels like an almost completely different composition. Reading the accompanying notes by Anselm Cybinski it was interesting to see how he characterises the work as being one in which Shostakovich ‘establishes a dual perspective right from the outset, allowing his harmonic imagination free reign against a backdrop of an unambiguous tonality’ going on to say ‘More than that, however, these miniatures present the listener with the complicated interaction of an often distinctly flowery language and a deeply emotional, first-person narrative.’ All these facets are perhaps even more under the spotlight in the Auerbach version than in the original. It was also equally interesting to read Daniel Jaffé’s review of the disc in BBC Music magazine (January 2017) in which his opinion is given that the transcription is generally so successful that one is rarely aware that the music is divided between two instruments. He does however, point out that there are inevitably some that are less successful than others, such as no.14 while he applauds no.17 as being a good example of how such spare material can be shared and I agree having listened to the original alongside this disc. In the notes accompanying the Naxos disc of the preludes played by Konstantin Scherbakov (Naxos 8.555781), Richard Whitehouse comments that by the time Shostakovich wrote them ‘the aim to shock has been transmuted into the desire to entertain’. Shostakovich alternated from the aim of shocking to entertaining throughout his career in addition to having to tread the socialist realist path which he also managed to do while for the most part managing to maintain his musical integrity. These transcriptions are an interesting and valuable addition to the viola repertoire as well as to the number of transcriptions there are of these endlessly fascinating piano works. Especially notable are the version for string orchestra by the Dogmar Chamber Orchestra (MDG 9121830-6), 15 Preludes from Op.34 played by Rem Urashin (piano) and Boris Andrianov (cello) (Quartz QTZ2107), and lastly a selection of 8 for the unusual combination of flute or piccolo or alto flute plus either vibraphone or marimba by Zara Lawler and Paul Fadoul, all of which show how adaptable Shostakovich’s music is and at the same time how brilliant. 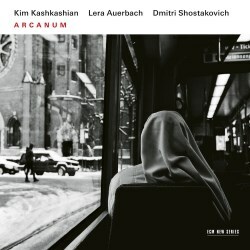 Lera Auerbach tours her transcribed version of Shostakovich’s preludes along with her own composition Arcanum which she wrote for Kim Kashkashian. She explains that “Arcanum means mysterious knowledge” and that the work seeks to raise the fact that within us all there are inner voices and knowledge which we may not articulate in words or even try to rationalise but that help us try to make sense of the world. When you add the “voice from within” the viola possesses according to the work’s dedicatee then the sonata takes on an additional level of meaning and shows that Lera Auerbach certainly chose the right instrument to make the argument. She further explains that the movement’s individual Latin titles are there purely as prompts to aid the listener “to explore their own individual questions and to kindle their imaginations”. Advenio, the first movement means to arrive and is spare in the extreme. The sonata’s slow movement is entitled Cinis and you can take your pick of the following meanings to bear in mind while listening to this “stylized funeral march” as Cybinski describes it: ashes; embers; spent love/hate; ruin; destruction; the grave; dead; cremation, so plenty to go at. Postremo means at last or finally while the closing movement is Adempte which translates as many shades of meaning centred around: to remove something by physical force, take away, rescue, confiscate, capture and much else. The sonata is a very successful one and an extremely welcome addition to the viola’s repertoire and will further help in dispelling the ridiculous and frankly boring postulation that the viola is in anyway an also ran among instruments. It is a marvellously crafted work of great beauty and its spare nature keeps its mystery well to the fore. Lera Auerbach writes that she hopes “that the music touches something within one’s soul that allows it to reach some places we may be too afraid to reach in everyday life” so a kind of musical Carlsberg! It is without doubt a profound and serious work. I found Postremo a particular favourite movement though the whole sonata is considerably affecting.